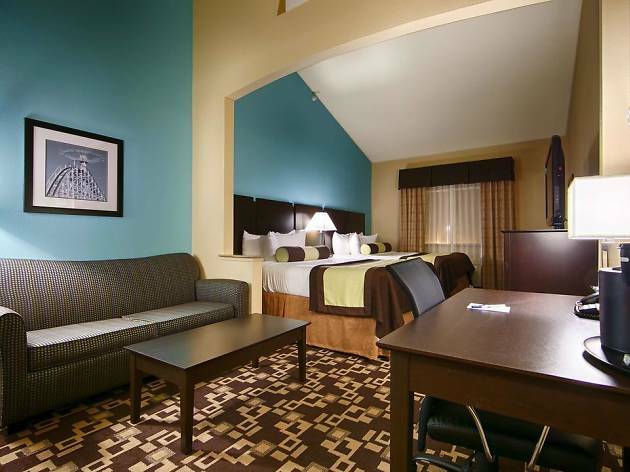 Whether you’re in Dallas to watch a football game at AT&T Stadium or a ball game at the Rangers Park or even a concert at the Verizon Theater, this Best Western is a good choice for its superb location near those venues. It’s also 7 minutes away from Dallas Fort Worth airport and the nearby business park. The rooms have a microwave, refrigerator and coffee-making facilities, as well as cable and satellite TV, free local calls and standard bathroom amenities. 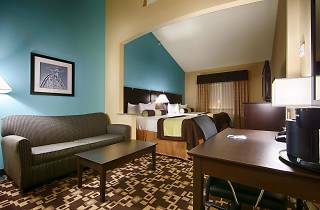 Families can also request sofa beds and adjoining rooms. Amenities include a fitness room, free breakfast, free Wi-Fi in public spaces, free parking, an outdoor pool, guest laundry, and a 24-hour business center. The hotel offers express checkout and late checkout depending on availability and has a no pet policy. There's also a free airport shuttle between 8am and 9pm. Transportation to the AT&T Stadium is available too, however, it’s drop-off only and costs $15 per room.